Where else could you expect to have a former priest offer a blessing to runners that one race organizer described as being something of a “Navaho/Irish” chant? 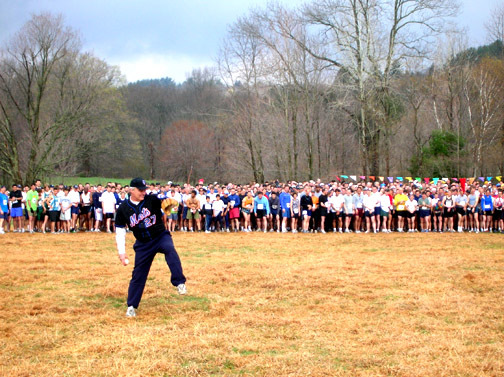 Or have a former New York Mets pitcher start the race by throwing out the “first pitch” – but only after coming to the set position and glancing over his shoulder to “hold” 760 runners on base? Or see two mud-splattered runners emerge from the woods wearing dress shirts and ties? Or another running barefoot over six miles of rugged woodland trails and jagged river crossings? It could only happen at one place – the Leatherman’s Loop race. One concession to modernity aside, the Loop returned to Ward Pound Ridge Reservation on Sunday with all the whimsical charm that has made it one of the most peculiar running events in the Northeast. Named after the solitary 19th Century vagabond who wandered the region wearing patched together leather, the Leatherman’s Loop has grown beyond its humble roots since the first race 19 years ago. The number of runners has grown fourfold over the last decade, and has been on the verge of cracking 1,000 for a few years now. But whatever the turnout, the Loop hasn’t lost its free spirit. The folksy eccentricity – and sense of fun – seems as durable as the Leatherman himself. “It’s retained its essence,” said Tony Godino of Bedford, who was among the race’s founders and has remained its main care-taker along with his wife Judy – although there are more helping hands than ever these days. Tommy Nohilly of Katonah won the race for the second year in a row with a time of 38:54, more than two minutes ahead of second place finisher Kris Kurjiaka. Kerry Arsenault was the women’s winner for the fifth time, in 46:57. The challenge of the 10K course draws runners near and far; but they also come to be part of the experience. The Loop has always been more than a race. In his remarks before the start, Daniel Martin of Cross River spoke of “this beautiful ritual” as the huge pack of runners gathered at the starting line. The Irish born Martin, a retired Catholic priest who has run the race several times, served as the race’s “spiritual counselor”, according to Godino. The philosophy of the Loop has always been more about enjoying the park and the natural beauty than about racing, and over the years Godino has tried to keep it true to its roots, despite the increasing popularity. Race organizers have never solicited or accepted corporate sponsorship, he said, and always run the race in their own, unorthodox fashion. This year, Godino was persuaded – actually, dragged “kicking and screaming,” he said – to accept an electronic timing system, typically found at any road race. But the Loop has never been typical; for 18 years, results were compiled by tearing pull tags off runners after they crossed the finish lines; the tags were then pasted onto poster boards, which were then pinned to the large teepee that has always been the focal point of the race site. That was as far as it went – until this year. “It was just getting to be too much work and too much stress with the old pull tag system,” Godino said, adding that a timing malfunction last year almost proved disastrous and convinced him that it was time for a change. This year, results were tabulated automatically and actually posted online by that afternoon on the Leatherman’s Loop web site. But, as if to make up for that intrusion of normalcy, Godino added a new twist to the start of the race this year by having former New York Mets ace pitcher Craig Swan throw out the “first pitch” to start things off. “I get these somewhat bizarre ideas and I thought since we’re starting the baseball season, it would be nice to do a first pitch. I do try to come up with something new every year to keep it fresh. I don’t want people to be bored.” Godino said he called his friend Swan, who lives in Stamford. Swan, wearing a Mets uniform and cap, and standing in the field about 50 yards in front of the large pack of runners at the starting line, tossed several warm-up pitches. When official race starter Lewisboro Police Chief Drew Marchiano raised the starting gun, Swan came to the set position, checked the runners, and delivered the pitch. The gun sounded and the runners were off. “He was going to do some shoulder fakes but I said, no, they might go on you and that would cause some problems,” said Godino. The runners charged across the grassy field “like a great herd of migrating wildebeest,” in Martin’s apt words, entered a path into the forest, and disappeared as if swallowed whoe by the hills. The eerie rumble of the pack’s collective voice was still heard after the last runner had gone in. Because of heavy rains on Saturday and overnight, the course this year was muddy and stream crossings more challenging. Nohilly’s hopes to break the course record were not helped by conditions. Although the weather was perfect on Sunday morning, the overnight rain also kept the turnout down. More than 900 runners had registered, but there were some 150 no-shows. “It would have been by far a record field if everybody had showed up,” he said. Two who did show up were Joe Stanley and Rick Hubbell, who both ran the Loop for the 19th time. They are the only two people to run every Leatherman’s Loop. And they can be expected back next year, when the event celebrates its 20th year. Godino is already planning to have a kids’ loop – a one kilometer run – about 30 minutes before the big event. And he envisions other possibilities to add to zany tradition of the Leatherman’s Loop – perhaps a mariachi band, or pipers, or both, playing for runners at certain spots along the route. Something unusual, and special can always be expected.